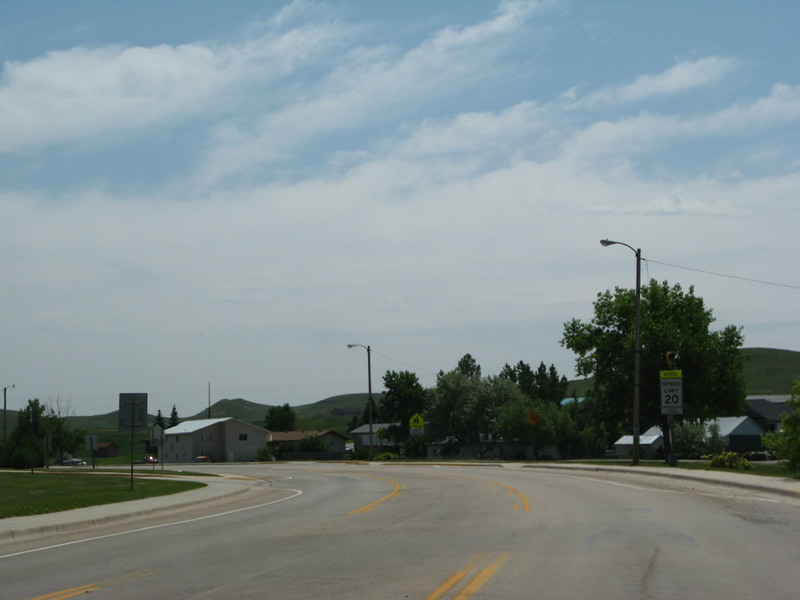 Wyoming 585 is a primary state route, connecting U.S. 85 at Four Corners (north of Newcastle) with Business Loop I-90 and U.S. 14 in Sundance. Wyoming 585 first appeared in 1933 and has maintained its alignment since that time. At that time, U.S. 85 had four U.S. auxiliary routes: U.S. 185, U.S. 285, U.S. 385, and U.S. 485. 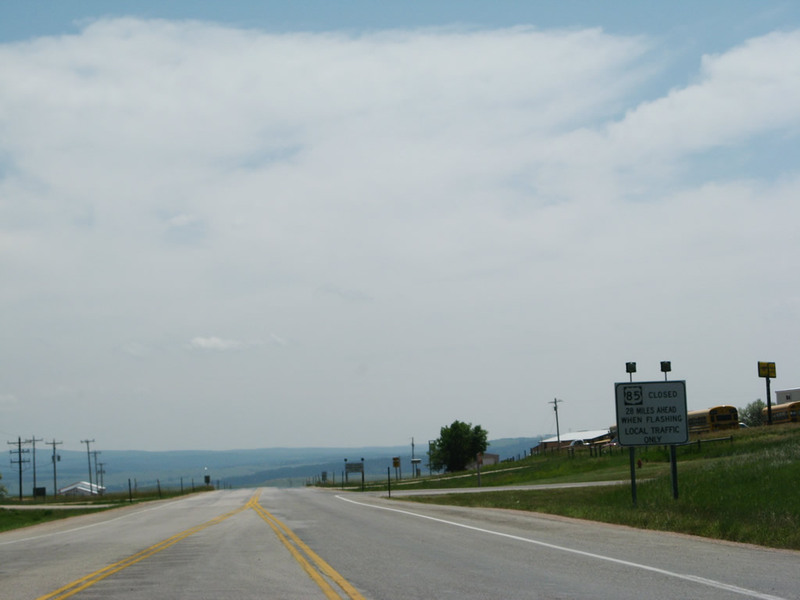 Planners possibly hoped to make Wyoming 585 into a U.S. 585, but that never happened. DeLorme's 1992 Wyoming Atlas and Gazetteer mistakenly refer to Wyoming 585 as U.S. 585. It never was a U.S. route, not even when U.S. routes as short as 28 miles long were common (see U.S. 116, 320, 420, etc.). 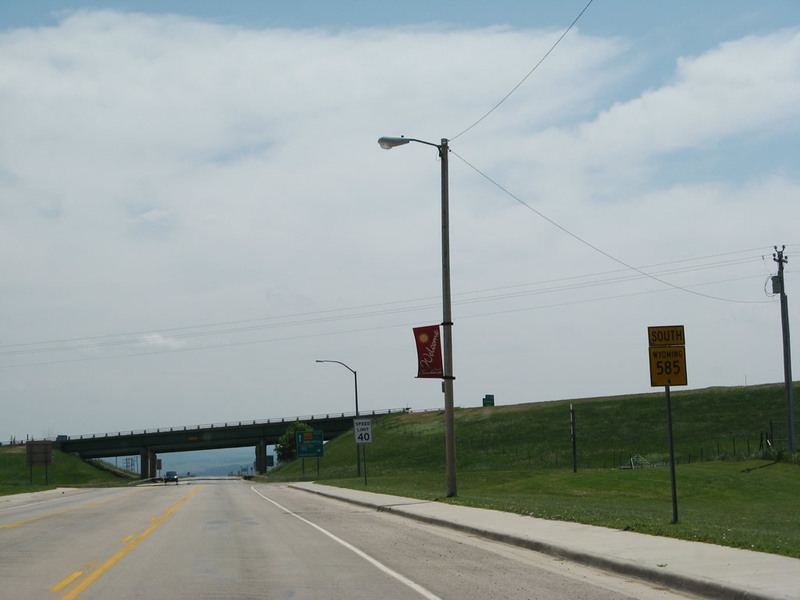 Wyoming 585 begins as it leaves its intersection with Business Loop I-90 and U.S. 14 near downtown Sundance. 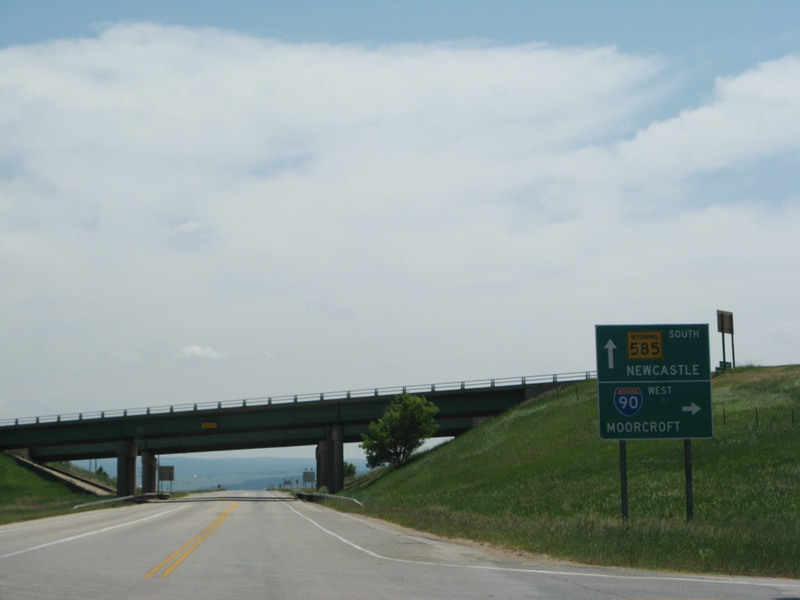 From here, Wyoming 585 will cross over Sundance Creek and travel southeast to meet U.S. 85 at Four Corners north of Newcastle. Photo taken 07/05/08. After passing over Sundance Creek, Wyoming 585 proceeds through a small residential area. Photo taken 07/05/08. Southbound Wyoming 585/Sixth Street approaches the interchange with Interstate 90. This major, transcontinental freeway connects Seattle in the west with Boston to the east. Closer to Sundance, Interstate 90 travels west to Moorcroft, Gillette, and Sheridan and east to Spearfish, Sturgis, and Rapid City. Photo taken 07/05/08. 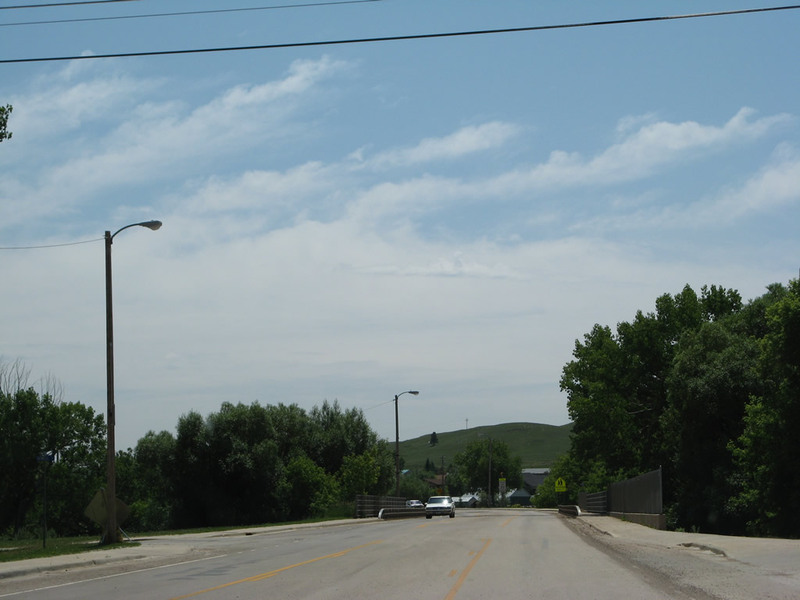 A Wyoming 585 south reassurance shield is posted along Sixth Street a short distance later. Photo taken 07/05/08. Southbound Wyoming 585/Sixth Street meets the ramp to Interstate 90 west to Moorcroft, Gillette, Sheridan, Billings, and Seattle (right turn). Interstate 90 is also part of the most direct route to Yellowstone National Park from here, either via U.S. 14 or U.S. 16. Photo taken 07/05/08. 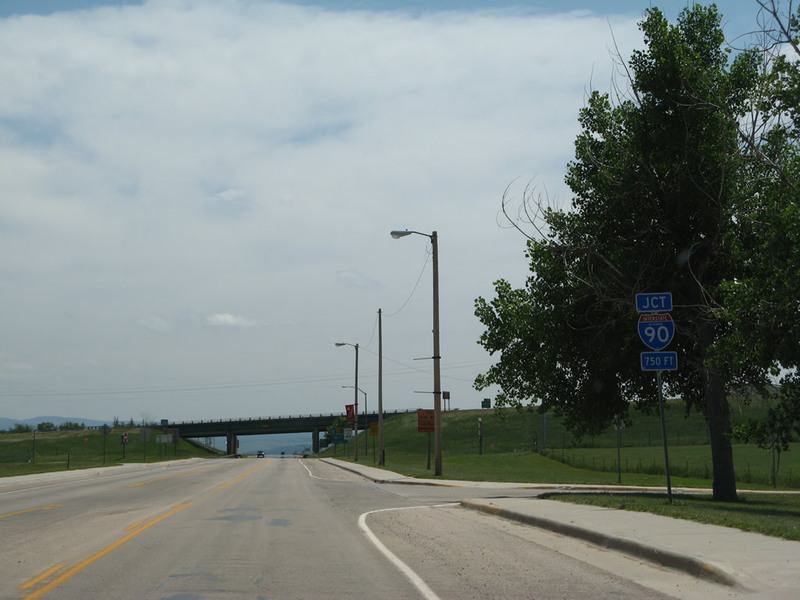 After passing under the Interstate 90 bridge, southbound Wyoming 585/Sixth Street meets the ramp to Interstate 90 east to Spearfish, Sturgis, and Rapid City. 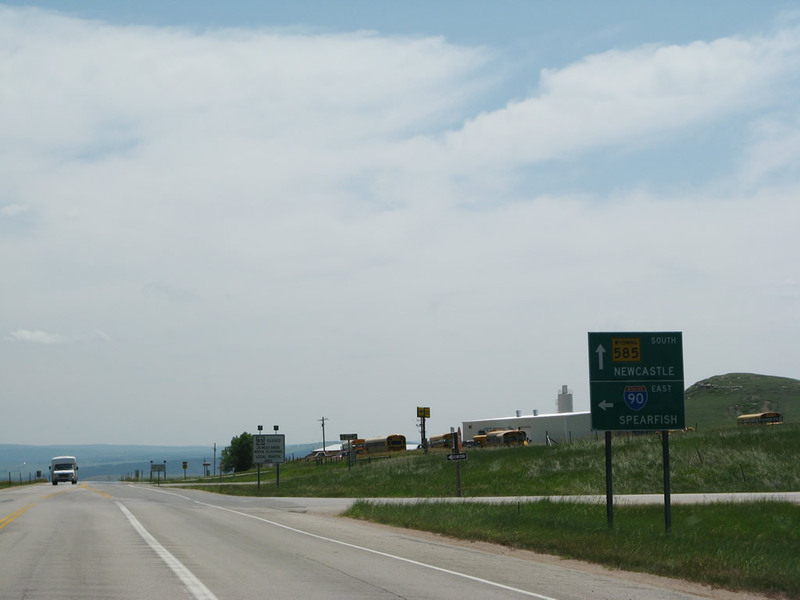 Interstate 90 is also part of the most direct route to the northern Black Hills from here, including Spearfish Canyon and Deadwood. Photo taken 07/05/08. If Wyoming 585 and U.S. 85 experience inclement weather that causes a road closure, this sign would flash. In that case, motorists should return to Sundance. Photo taken 07/05/08.